My Mother Died With Just $500 in Her Checking Account – Do I Need to Open a Probate Estate? 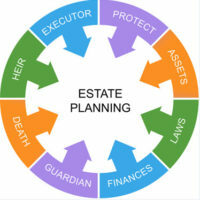 Some people think that when a family member dies, that means there must be a probate estate. In fact, there are many situations where a person does not leave any assets that are subject to probate–i.e., they were placed into a trust or subject to joint ownership. But what about cases where someone only leaves a small, seemingly insignificant amount of probate assets? Do you still need to open an estate for such cases? Let’s take a simple hypothetical example. Allison lived with her elderly mother, Rebecca, at Allison’s condo. Rebecca did not own any assets solely in her name, with the exception of a small checking account that had a balance of just $500. Allison was not a co-signer on the account and did not even learn of the account’s existence until after her mother passed away. Allison paid all of Rebecca’s bills out of her own pocket. This included her mother’s final medical bills and funeral expenses. Rebecca left a will giving all of her property to Allison, her only child. So does this mean Allison needs to open a probate estate to get the $500 in her mother’s checking account? In this scenario, the answer is no, a formal probate is not necessary. Instead, Allison can go to the local circuit court and file a petition for a “Disposition of Personal Property Without Administration.” This is basically a request for court order to release Rebecca’s checking account to Allison. The request must be for personal property only, not real estate. The deceased person’s final medical and funeral expenses must have been paid in full using out-of-pocket finds, i.e. not by insurance or under a prepaid funeral plan. The personal property must be exempt from creditor claims under Florida law. Non-exempt property may also be transferred if its value does not exceed the amount of the deceased person’s final medical and funeral expenses. The person filing the petition for disposition must be the same person who paid the final medical and funeral expenses, or they obtained written consent from the person who did. If the personal property claimed is a motor vehicle or household furniture, the person filing the petition must be either a surviving spouse or child of the deceased person. In case you are wondering, the references to “final medical expenses” are more precisely defined in the law as the “reasonable and necessary medical and hospital expenses of the last 60 days of the last illness” of the deceased person. It is not necessary for the deceased person to have signed a will in order to take advantage of the disposition without administration process. But having a will is still a good idea for everyone, regardless of the amount of assets you currently own. If you need advice regarding wills or probate from an experienced Fort Myers estate probate lawyer, contact the Kuhn Law Firm, P.A., at 239-333-4529 today to schedule a free initial consultation.